After having so much of a good time tangling The Spiral Guide I combined all the spirals into a large Zentangle Inspired Art. The size is 60cm x 85cm (231/2" X 33"). I just want to say a big thank you to all you wonderful tanglers for visiting and commenting, I really appreciate your lovely words and encouragement. Love, hugs and best wishes to everyone for a safe and happy Easter. Hi Mum this one is wounderful so much detail I like the red in it. Oh my gosh! So beautiful. 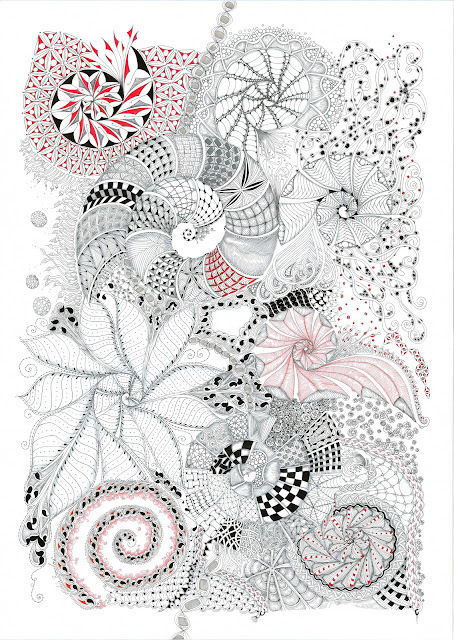 You are indeed a zentangle spiral master. Wow! Can't imagine how much time went into this, it is one GORGEOUS piece of Zentangle-inspired art. As if we needed further proof you are indeed "Queen of the Spirals"! Thanks so much for your amazing inspiration and a very Happy Easter to you too. I'm running out of superlatives for your pieces - this one - Majestic - can only imagine what it looks like in person. Fabulous! It looks very festive. I make too many mistakes to even think about something this size. Oh don't worry I make little slip ups, it doesn't matter they can be hidden or changed into another tangle. Your spirals are amazing. Do you freehand them or use a template. You should sell posters on etsy! They are freehand Cris, it's ok for a swirl to go a bit wobbly. Yes, I might try Etsy! I'm speechless, so very beautiful! Love love love your spirals ! ! ! When I grow up, I want to draw Zentangles like you! lol... Your work is so beautiful!